A lot of innocent dogs are neglected, abandoned, and sometimes, even abused. These animals are forced under several circumstances no pet should go through as they struggle to survive with limited food, water, and love from humans. People assume that dogs are put into a shelter because they must have some sort of defect. However, this is not the case—dogs are sent to animal shelters usually because they have been deserted by their previous owners. So when thinking of getting a pet, they resort to buying from a pet store or breeder. Adopting a pet from a shelter doesn’t even cross their minds. There are a lot of homeless yet adorable and loving animals in shelters waiting for a home. So if you are thinking about getting a dog for your family, you might want to consider checking out these organizations where you can adopt your very own furry friend. Thanks to everyone who went and saw the Philippine Army K-9 Battalion Unit’s demonstration earlier at Waggin’ Tails 2018. We sure had a fun time playing with Merly backstage! It’s her first day out! 💙 Catch Day 2 of the event tomorrow, April 8, 2018. So many goodies and fun activities waiting for your fur babies! Hound Haven is an institutionalized organization and animal shelter in Bulacan. They are dedicated to improving and rehabilitating the lives of retired Military Working Dogs (MWDs) and Contract Working Dogs (CWDs) in the Philippines. During the dogs’ stay at the Hound Haven center, they undergo behavioral training (and physical training if it is recommended by their partner vets) to prepare them for possible adoption. Their ultimate goal is to help these dogs live the remaining years of their lives as normal family pets. If you’re interested, check out the adoption process and adoptables who are in need of a loving home. PAWS is a volunteer-based, non-government organization with the goal to prevent animal cruelty through education, animal sheltering, and advocacy. 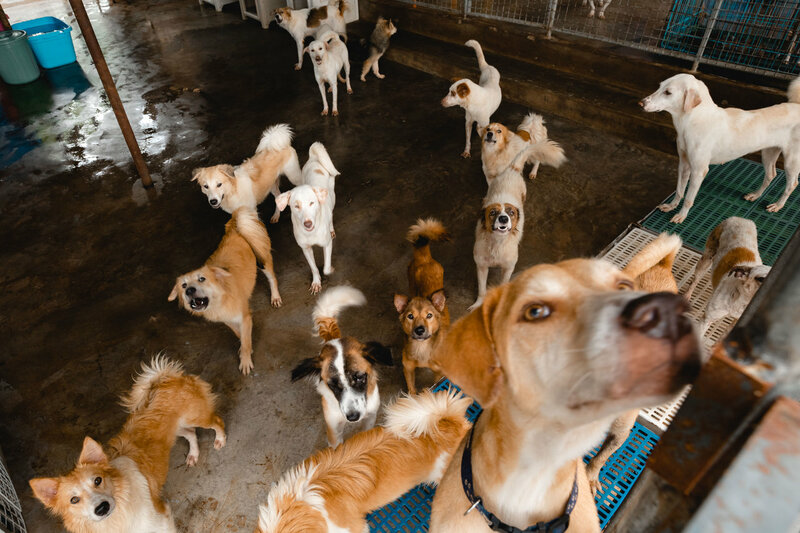 They run an animal shelter called PAWS Animal Rehabilitation Center (PARC), which currently houses dogs and cats that have been rescued from cruelty or neglect. For any queries about any particular dog, you may contact their office at 475-1688 from Mondays to Saturdays, between 10 a.m. to 5 p.m. You may also visit PARC along Aurora Blvd., Katipunan Valley, Loyola Heights, Quezon City to find out more about your prospective adoptee. CARA Welfare Philippines is a non-profit, non-government organization that solely relies on private donations. Since their launch in the year 2000, they have been advocating for animal welfare in the country through education, public awareness, affordable sterilization and veterinary care, and the rehabilitation and rehoming of dogs (and cats) in need. You can choose an animal from the CARA Animals Database “Adopt Me” album. PART is another non-profit and no-kill animal rescue and rehabilitation center. It is their mission to rescue abandoned, injured, and unwanted animals. They provide quality veterinary care, spaying and neutering, rehabilitation, and rehoming for strays. You can visit their shelter in Bulacan on Thursdays to Sundays from 11 a.m. to 5 p.m., while volunteer hours are from 8 a.m. to 12 p.m. or 1 p.m. to 4 p.m. on Wednesdays, Saturdays, and Sundays. It Started With Sam was founded by four friends with the goal to rescue and rehabilitate stray and abandoned animals. According to founder Marissa Alejandro Lopa, they are on a continuous wheel of rescuing, fostering, and finding homes for these animals. As of now, they don’t have a structured method, aside from a questionnaire that adoptees have to fill out, for finding homes except by word of mouth or on social media. MBY Pet Rescue and Sanctuary was started in Japan by a Filipina, who first adopted a cat to solve a rodent problem at home. Soon after, she began holding trap, neuter, and release (TNR) operations in Japan. Today, MBY in Morong, Rizal, is home to a number of dogs and cats that are ready for adoption, waiting for new homes. There’s no adoption fee but there is a stringent adoption process that involves screenings and house visits to ensure that the animals are put in a suitable and pleasant environment. What’s it like living with 600 cats and dogs?